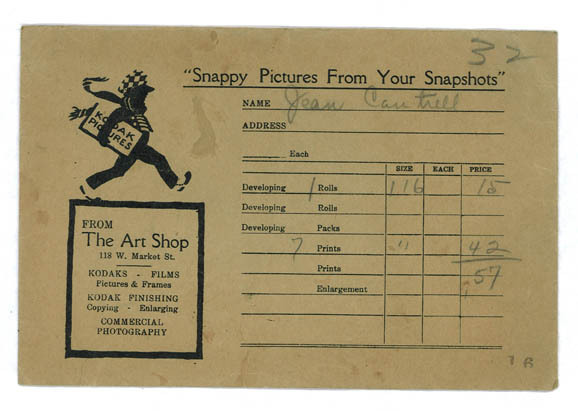 We knew The Art Shop was once a photography studio in addition to selling art supplies and custom framing. In fact, a client once brought us an old photography sleeve from those days. 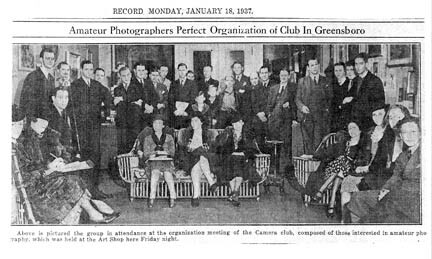 We had also heard The Art Shop had organized the first photography club in Greensboro, but here was photographic evidence. This discovery prompted me to do a little research on the previous owners, Charles & Anne Farrell. In addition to owning The Art Shop, Farrell was the first professional photographer for the Greensboro Daily News and captured some of the first aerial photographs in the state.. He contributed his photographs to five books printed by the University of North Carolina Press. Anne was also a commercial photographer and contributed articles and images to American Girl Magazine. Ann took over The Art Shop after Charles became seriously ill and in 1960, sold it to his sister, Mary Farrell Hedrick. Lenny’s father, Stan Dolin, purchased The Art Shop from her in 1964 and Lenny and I purchased it from him in 1989. As owners of Greensboro’s second oldest business (The Art Shop opened in 1899 -Schiffman’s is the oldest 1892), it’s fun to happen upon a bit of history. How To Insure Your ArtDo You Remember Walter Keane?